Following a trial period of online bookings, several issues came to light. We believe that we have now overcome these problems and are now ready to reintroduce the online booking system. All members who were registered in the 2016/17 year and currently registered in the 2017/18 membership year will be able to access the online booking. 1. Once downloaded enter Condado de Alhama Golf Society and click Find Club tab. 2. Select your name from drop down menu. 4. Enter personal password, confirm and then click Set Password tab. 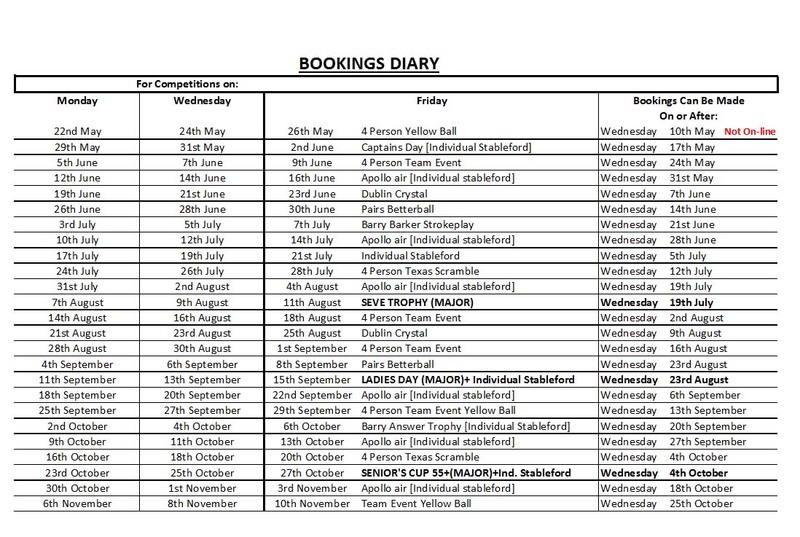 You will now have access to master scoreboard where as well as booking into competitions you can view competition fixture lists, competition results and society notices. There is also a different version of master scoreboard for smart phones. 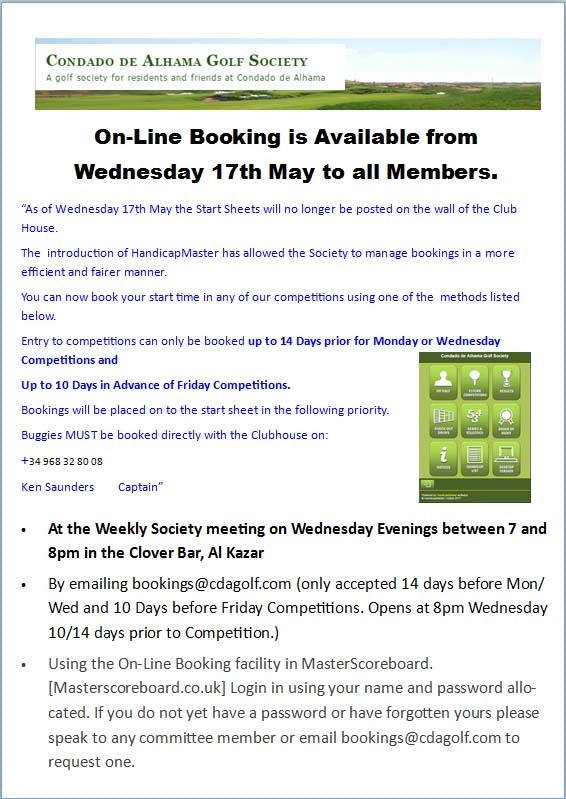 Every Wednesday evening at the weekly meeting of the Golf Society at the Clover Bar a new Monday, Wednesday and Friday competition will be opened for entries. Priority for tee times will be given to members who attend the meeting. At the closure of the meeting online bookings will be made available to all members. Members booking online can select available tee times and one member can add other members to the same tee time. 1. Attend between 7-8pm Wednesday evening at the Clover Bar. 3. See any committee member on a competition day. 2. By asking a fellow member on Condado de Alhama to book for them. 1. Using the Master Scoreboard built in facility. 1. In the first instance the member will be suspended from using the online booking facility or email facility, the term of the suspension will be determined by the committee. Bookings into competitions will only be allowed by personal appearance at weekly society meetings. 2. In the second instance within 12 months of the first, the member will be suspended from using the online booking facility, email booking facility and playing golf in society times for a period of 6 months or a period of 28 on site days, whichever occurs first. The suspended member must provide proof of being present on Condado de Alhama (i.e, Boarding pass, Excluding travel days ) to a committee member. 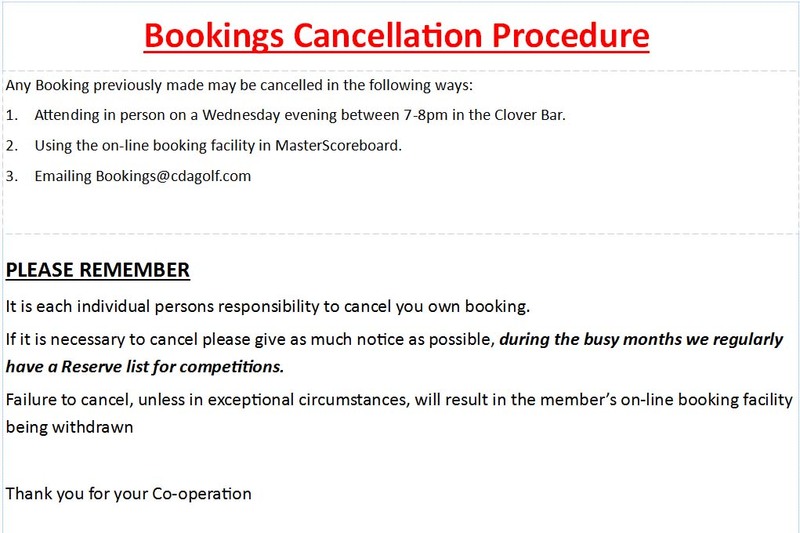 Members who have booked into competitions but not renewed their membership fee must do so at a Society meeting, the latest being on the Wednesday night prior to a Friday competition. (Unless they arrive at Condado de Alhama after the Wednesday evening meeting, then they pay the fee on Friday). Members playing on Monday & Wednesday competitions may pay their membership renewal fees on the day of competition if they cannot make the Wednesday evening meeting. 1. Any member wishing to play with a Guest may book themselves into the competition on-line but the request for their guest to play MUST be forwarded via email to bookings@cdagolf.com or condadogolf@outlook.com they cannot be booked in on-line. Guests will ONLY be added to the start sheet when on-line bookings have closed to members. Guests are not eligible to play in Society competitions. Friday’s competition will close at 8pm on the Wednesday prior. Monday’s & Wednesday’s competitions will close 24 hours prior to competition. By adopting and fully embracing the online booking facility there is no longer a need to post start sheets in the clubhouse. However the Pro shop staff will be forwarded a start sheet 24 hours prior to a competition day. It is a condition of entry that all names entered will take part in the competition.